The first set of information below is from files within Wikipedia. Later information has been gathered from delving through books within local libraries & church records. The forest was on extensive lands owned by the Berkeley family of Berkeley Castle in Gloucestershire, home to extensive stocks of wolf, wild boar and fallow deer. In the 13th century Thomas de Berkeley was assigned to be the keeper of the Tutbury ward, and while resident at Tutbury Castle liked to hunt the forest, and had a hunting lodge built, Byrkley Lodge. In 1267, Thomas married the daughter of William de Ferrers, the Earl of Derby. During the rebellion of Simon de Montford against King Henry III, the de Ferrers family allied themselves with the rebellion. After the rebellion was put down, the de Ferrers were forced to forfeit their estates to the crown. Henry III gave the forest to his son Edmund Crouchback, 1st Earl of Lancaster, in 1266. Renamed Needwood Chase or royal forest, it was subsequently owned by the Duchy of Lancaster until it passed into the possession of Henry IV in 1399. By this time the lodge had become the residence of the local keeper (judge). The lodge was redeveloped by King Edward IV, and used extensively for hunting by both him and King James I. It was during this period that the forest became commonly associated with Sir Gawain’s Green Knight. 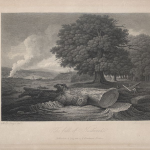 In 1776, Francis Noel Clarke Mundy privately published a book of poetry called “Needwood Forest” which contained his own poem of the same name and supportive contributions from Sir Brooke Boothby Bt., Erasmus Darwin and Anna Seward. The purpose of Mundy’s poems was to resist calls for the enclosure of the forest. Seward wrote a poem called “The fall of Needwood Forest”, which she regarded as “one of the most beautiful local poems“. Seward’s parents adopted Hannah Sneyd, who was probably related to the engraver, Mary Emma Sneyd. By the early 1790s, Thomas Gisborne held the perpetual curacy of Barton-under-Needwood. 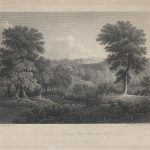 Gisborne regarded Needwood much as Gilbert White did Selborne, and wrote of his walks in the forest to resist enclosure. The former forest area now encloses some twenty farms, on which dairy farming is the principal enterprise. Byrkely Lodge was demolished in 1953, and today its former grounds are today the site of the English National Football Centre, St George’s Park. 490 acres (2.0 km2) of woodland remain, with some parts still open to the public. Jackson Bank loacted at Hoar Cross is a mature, mixed 80-acre (320,000 m2) woodland still owned by the Duchy of Lancaster, which is open to the public. Bagot’s Wood near Abbots Bromley claims to be the largest remaining part of the forest. The National Forest is an environmental project planned to link the ancient forests of Needwood and Charnwood. Portions of Leicestershire, Derbyshire and Staffordshire are being planted, in an attempt to create a 200 square miles (520 km2) area of blend ancient woodland with new plantings to create a new national forest. Shaw, writing in 1799. says that by the early days of Queen Elizabeth the forest consisted of 9,229 acres, divided into four wards; Tutbury Ward, which was 9 1/2 miles round; Barton Ward, six miles round; Yoxall Ward, 8 1/2 miles round: and Marchington Ward, 10 miles round. In addition there were ten parks, Castle Park, Rolleston Park, Stockley Park, Castle Hay Park, Barton Park, Shireholt Park, Highlands Park, Agardesley Park. Hanbury Park and Rowley Park. The Forest was watered by four streams called Ealand Brook, Marebrook, Linbrook, and the Swarbourne. In each of the Wards there was a Lodge. Byrkley Lodge in Tutbury Ward was written Brickley Lodge, and had formerly been written Berkeley Lodge, taken the name from Thomas de Berkeley, Baron of Berkeley who married Joan, daughter of William de Ferrers. Thomas de Berkeley was Keeper of Tutbury Ward in the time of King Henry III. Sherholt Lodge in Barton Ward was formerly the property of Lord Vernon of Sudbury, Ranger of Needwood Forest in 1670. Yoxall Lodge, on the Linbrook, was formerly held by the family of Hart, and sold by the family to John Gisborne, Esq. In Marchington Ward was the Ealand Lodge. ln this ward was the famous Swilcar Lawn Oak. Shaw, in 1798, quoting Marshall’s. 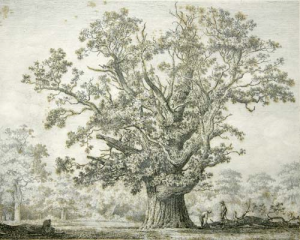 ” Rural Economy of the Midland Counties,” gave the oak a girth of 21 feet at a height of five feet. J.E. Nowers in 1908 gave a measurement of 25 feet at the same height. All agree that this magnificent oak contained about a thousand cubic feet of timber, and was about sixty feet high. The famous oak is now no more. Another famous oak. the Beggars’ Oak, in Bagots Park in 1905 was 26 1/2 feet in girth four feet from the ground, and was about sixty feet in height The massive arms were formerly supported, but during the last two years these supports have been removed, and the arms breaking off, the former forest giant is but a tragic figure. In 1658 the Needwood Forest was surveyed, and but for the Restoration of King Charles 11 would probably have been disafforested. There was evidently a further agitation for disafforestation and enclosure in 1684, for a warrant was issued to Willam Harbord, Surveyor General, to make an exact Survey and Valuation of the Manor of Tutbury belonging to the Duchy, with the Forest or Chase of Needwood. The Survey was made in June, 1685, estimating the value at £32.912 and the value of the wood at £30,699, making a total value of £63,611 11s. 9d. The Surveyor General commented that the Honor, the Manor of Tutbury and the Forest of Needwood were so valuable that they should be preserved in the Crown, and in-no way alienated from it. . When finally Needwood Forest was disafforested and enclosed in 1801, it appears that there were 9.400 acres of woodland and common. These 952 acres were disposed of as follows: 212 acres to the lay Rector and 93 acres to the Vicar of Hanbury. 180 acres to the lay Rector and 76 acres to the Vicar of Tutbury. 175 acres to the Vicar of Yoxall. 215 acres to the Rector of Tatenhill. The old enclosures and Lodge lands composed about 500 acres and were to be subject to yearly rent charges in lieu of tithe. The division of the lands was some-what unfair, in that the smaller freeholders and copy-holders had small sections of land in various parts of the forest, in many cases so far away as to render their allotments of little use. The grubbing up of the trees and the subsequent draining and cultivating of the land has been of incalculable value. The trees of the Needwood Forest were chiefly oaks, limes, thorns, hazels, and maples, and Shaw in 1796 stated that there were no elms or beeches in the Forest, ” though the former tree flourishes extremely in the neighboring enclosures.” There were many hollies, formerly encouraged as winter feed for the deer, and at Six Lanes Ends are some examples. At the time of the disafforestation there were some three thousand deer, and about the same number of horned cattle and horses. The cattle and horses were the property of freeholders in the surrounding villages, who had the right to put them on the forest at an agreed annual sum. Each village having its own brand, changed yearly, there must have been stirring scenes at ” round up,” as exciting as any Wild West rodeo. With enclosures and disafforestation, the deer were largely hunted out, and the forest spoiled. although it was originally decreed that no trees over six inches in diameter should be felled. Only the less accessible parts, and the steep slopes on the Marchington side, which precluded the use of the plough were saved. But in some of the parks, notably, Yoxall, one may still gain an idea of the grandeur of the old Needwood Forest, and there are still deer, badger, hare. rabbit. and the lesser vermin. The fox is preserved and the Meynell Hunt, with kennels at Sudbury, includes the Forest in their country. The Woodmote Courts, which had dealt with poaching, trespass and other Forest offences fell into disuse after the enclosure of 1801. and for some years the Forest was the common hunting ground for the freeholders and villagers who, prior to the enclosure had enjoyed rapidly increasing privileges. This did not suit the local landowners, and others who had gained large tracts of Forest land, and they determined to suppress what they felt was a threat to their privileges. The Forest Association for the Preservation of Game came into being on 21st September. 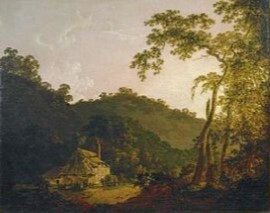 1811, when the following agreement was signed at the Mosley Arms Inn, on the verge of the Forest. It is now the New Inn. Given under our hand the 21st September. 1811, R. J. Harper on behalf of the Duchy of Lancaster and or himself (New Lodge). Fran. Calvert on behalf of Lord Vernon and himself (Houndhill). Harvey on behalf of the Earl of Dartmouth and Lord Bagot and for himself. Oswald Mosley (Rolleston). John Spencer (Needwood). Robert Stone (Needwood). Jno. Peploe Mosley (Rolleston). Edward Green. Thomas K. Hall (Holly Bush). At first the rewards were fairly high, as befitted the danger accruing to such a step, and on 30th December, 1816, £10 was paid to John Walls, one of the Duchy keepers for the apprehension of John Twigg, with an additional 10/- in expenses keeping him till he was sent to Stafford. £2 10s. was paid to John Bannister for his trouble in discovering Adam Grimley setting a snare on the Crown Lands. The severity with which the Association pursued the prosecution of poachers, many of whom were men who had formerly held Forest rights, and could not appreciate why these should be taken away, did not endear the members to the general public, As will be seen the local clergy were members, in right of their gifts at Enclosure, and such action by the shepherds could not be calculated to increase the affection of the flock. One cannot resist a sneaking sympathy with the man who stole the hare from the Forest rather than with he who stole the Forest from the hare!